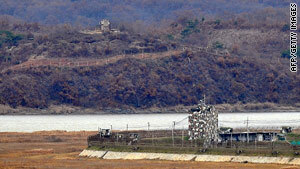 The DMZ between North, left, and South Korea remains one of the world's most militarized. (CNN) -- North Korea on Monday proposed replacing the 1953 armistice that ended the Korean War with a formal peace treaty, a step it said would pave the way for breaking the international impasse over its nuclear program. But the communist state said international sanctions imposed after a series of nuclear weapons and missile tests should be lifted before it returns to the negotiating table, a suggestion the United States quickly dismissed. The cease-fire that ended the three-year Korean War never led to a permanent peace treaty, leaving the North Korean-South Korean border the world's most heavily militarized frontier. In a statement carried by the official news agency KCNA, North Korea said that a final settlement of the conflict is "essential" to talks aimed at persuading it to dismantle its nuclear program. "When the parties are in the state of war where they level guns at each other, distrust in the other party can never be wiped out, and the talks themselves can never make smooth progress, much less realizing the denuclearization," it said. "Without settling such [an] essential and fundamental issue as war and peace, no agreement can escape from frustration and failure as now." Pyongyang has refused to return to the talks, which also involve the United States, Russia, China, South Korea and Japan, insisting that it wants to talk directly with the U.S. government. But Washington says it will not lift sanctions or normalize relations with the North until it takes irreversible steps toward dismantling its nuclear program. "We're not going to pay North Korea for coming back to the six-party process," State Department spokesman P.J. Crowley said Monday.